The performing arts groups at Royal Oak High School are so very grateful for the help that you provided this weekend working at the beverage booths or working the gates. We ask for many volunteers and have you in the heat, sun, and rain, but your work and efforts will result in dollars that will help our students of the arts! ​Thank you so much for the work you did and we cannot say THANK YOU enough. ROHS Band, Choir, Drama, and Orchestra. Soon we will have the amount of our Total Donation from Arts Beats and Eats. Look for it HERE or on our Facebook Page. Where is my name ﻿on the plaque﻿, or the back of a seat? If you were one of the generous people that donated to the ROSPAC cause to replaced the 57 year old seats in the ROHS Kimball Auditorium, then your name is on our commemorative plaque that was just installed outside the auditorium. 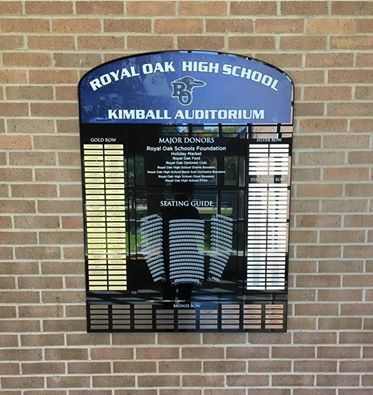 Also included on the plaque are the names of most every ROHS, Kimball and Dondero High School Band, Orchestra, Choir and Drama director since 1957, the year Kimball High School (now named Royal Oak High School) was opened. Next time you are at the auditorium, go look for your name or the names of those who made the seats possible. All of your efforts donating money and time have finally paid off! For the first time ever, students performed in front of our new seats!! Three groups performed, the Concert Band, Symphony Band, and Wind Ensemble, in that order. The Wind Ensemble performance included the premier of "WINGS!," composed by ROHS Band Director David Jensen for the occasion. It was an excellent tribute to celebrate our acheivement and see the fruits of our labor in use. By the next concert, our plaque will be on display for everyone outside the east door of the Kimball Auditorium. Donors can check their name on the plaque! Also, check out this article in the Royal Oak Tribune about the concert, the ROSPAC Effort and the Renovation by the School District. Here's a very nice article about ROSPAC being honored at the Royal Oak Schools Board Meeting on Tuesday October 11th. 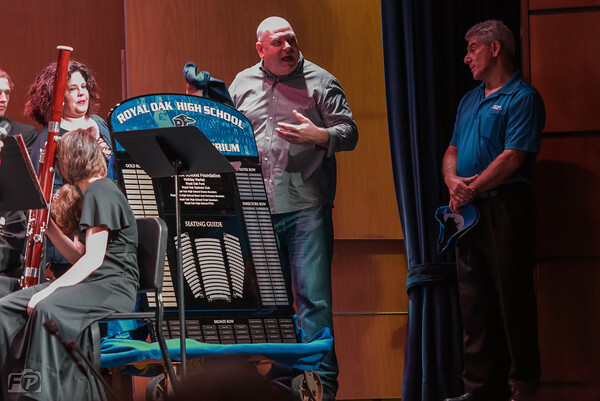 None of this would have been possible without the 400 volunteers, 200 donors, 50 sponsors and support of the Royal Oak Schools to make the auditorium a huge success. The honors and accolades are all yours. Thank You! We want to say a heartfelt THANK YOU to everyone who donated to ROSPAC over the last 18 months. 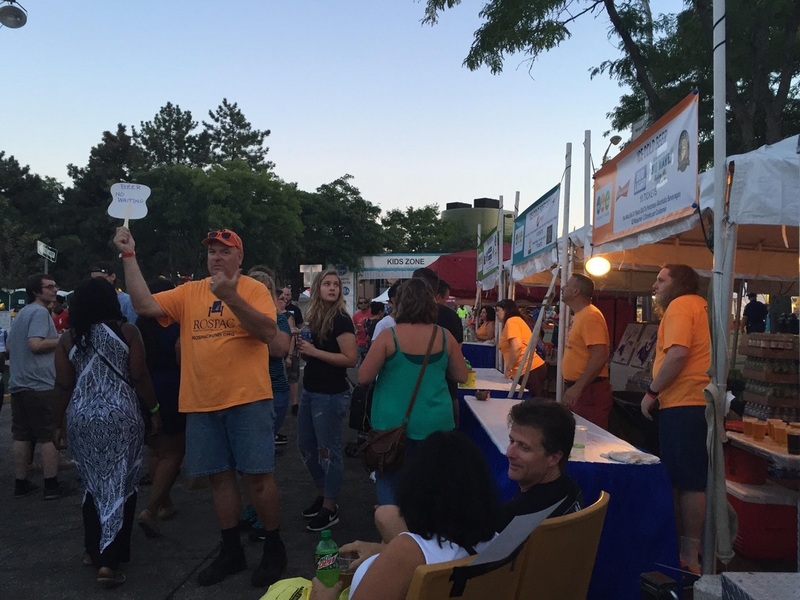 If you were not at Arts Beats and Eats this weekend, you missed the army of volunteers in who filled over 140 Beer Tent and Entry Gate shifts. It filled our heart to see all of the teamwork at the Beverage Tent and a basement full of bright orange ROSPAC T-Shirts before we “deployed” to our gates during the final hours of the weekend. 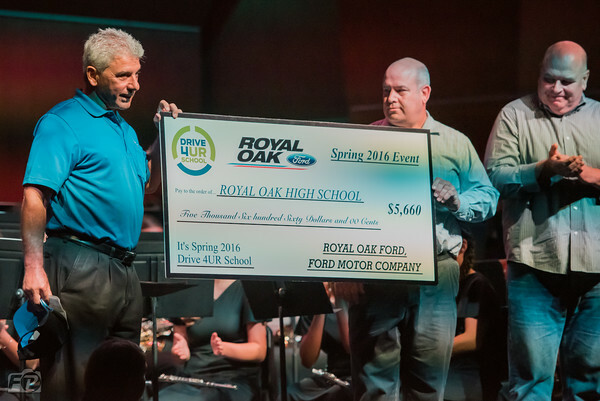 If last year is any judge of the donation from Arts Beats and Eats, this will easily put us over our goal of $100,000 to replace the 57 year old seats of the Royal Oak High School Kimball Auditorium! It’s not often that you get to participate in a charity where you meet your goal and it is over. Curing Cancer, raising money for school clubs … they are so open ended and there is never a point where you can say “WE DID IT!”. This time, you can. Right now, where ever you are at, stand up and say “WE DID IT!”. <Fist Pump>. Our mission is accomplished! 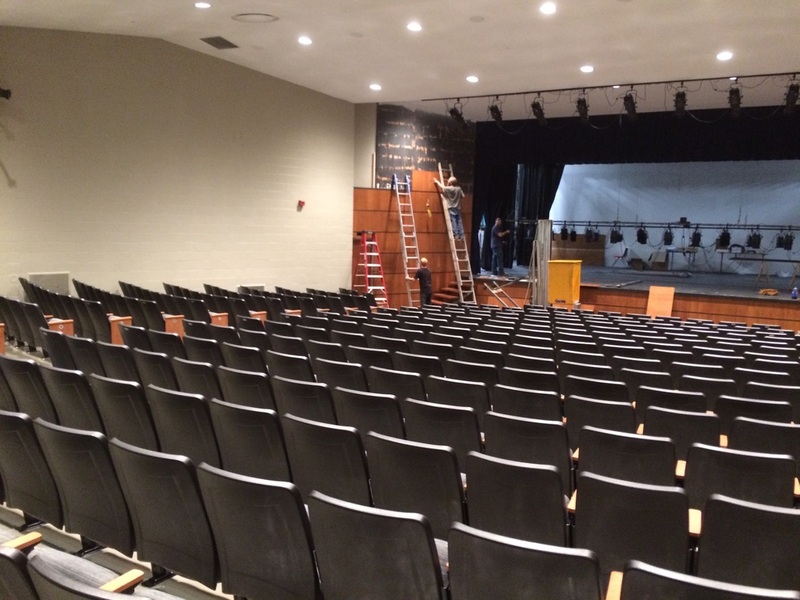 As soon as we recover from AB&E, we will update the website and Facebook page with some photos of the newly renovated auditorium, some photos from the weekend and update our donation thermometer to over 100%. 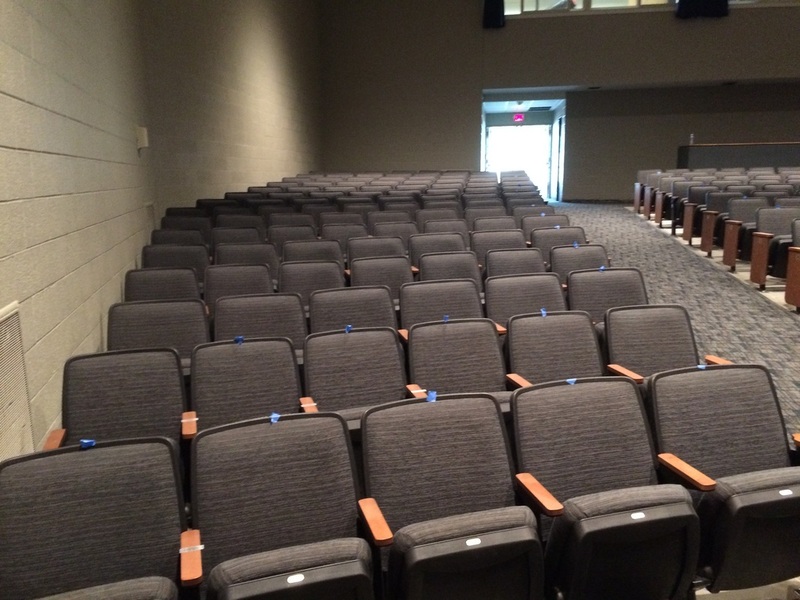 If you attend ROHS, have children who attend or work there, you can peek in and see the finished auditorium right now. If not, we will find a date and time where everyone who donated time and/or money can come and see the auditorium and we can thank you in person for your efforts. Or, do what we do. Attend a Performance by our talented students as often as soon and as often as you can. And when you are relaxing in the comfy new seat, think to yourself … “I helped do this”. ROSPAC HAS PASSED THE GOAL OF $100,000! 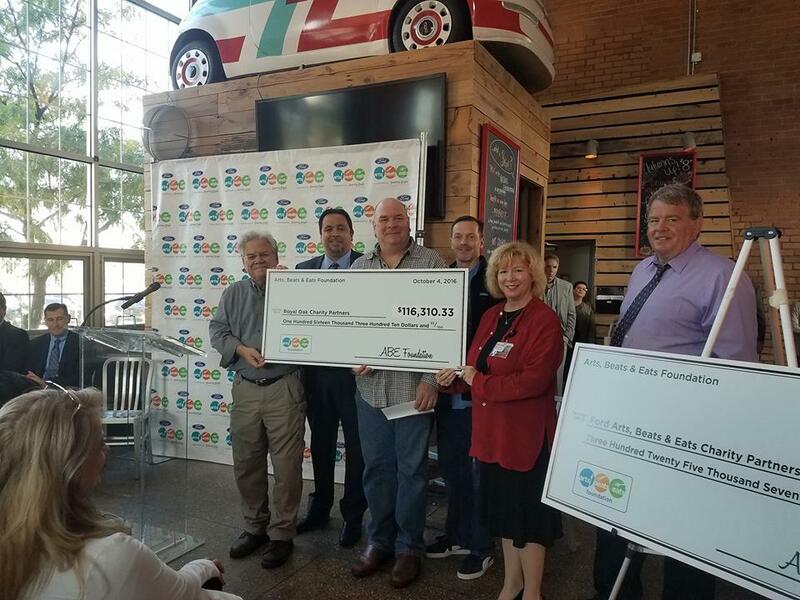 With the anticipated income from Arts Beats and Eats, WE HAVE PASSED OUR GOAL OF RAISING $100,000!! We won't know the official numbers for a while, and there is still time for you to donate and get your name on the plaque or on the back of one of the new seats. But we know the current amount is around $104,279.16!! Thanks for visiting the Royal Oak Schools Performing Arts Committee webpage. We have some of the most talented performers in the state and our goal is to help provide facilities and equipment that match their excellence. Just think, since we accomplished this goal last year, we can continue this this year and do something else great for the students! If you look closely at our plaque, there is still room for more folks to commerate those who donate to replace the seats in the Royal Oak High School Auditorium. There will be occasional costs to keep up the auditorium, and all additional funds are being saved for that. There is a level for everyone. Donate $500 or more and your name will be included in the "Golden Row" Plaque outside the auditorium, or donate as little as $50 and walk away with a ROSPAC T-Shirt. Click here for more information!